BARCELONA, Spain & SAN FRANCISCO--(BUSINESS WIRE)--Feb. 22, 2016-- MOBILE WORLD CONGRESS – Visa Inc. (NYSE:V), today announced that its leading online payment service, Visa Checkout, will be available to merchants and consumers across France, India, Ireland, Poland, Spain and the United Kingdom this year. 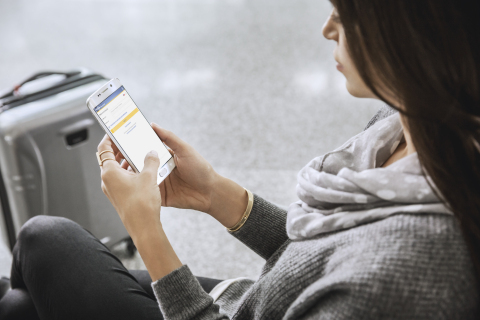 Visa Checkout brings the security and convenience of the Visa card to the digital world, creating a better way to pay with mobile and connected devices. Visa Checkout is extending its international availability as eCommerce is also increasing in usage among consumers across the world, particularly on mobile devices. According to eMarketer, in 2015 global ecommerce grew 22.7 percent year-over-year1. Online and mobile commerce are among the fastest growing shopping channels, with mobile specifically growing at a rate of 32 percent annually2. Since its introduction in 2014, Visa Checkout has launched in 16 countries, with usage growing to more than 11 million consumer accounts and acceptance by more than 250,000 merchants. In 2016, the service will reach a total of 22 markets around the world, including Australia, Argentina, Brazil, Canada, Chile, China, Colombia, France, Hong Kong, Ireland, India, Malaysia, Mexico, New Zealand, Peru, Poland, Singapore, Spain, South Africa, United Arab Emirates, the United Kingdom and the United States. According to new independent research from comScore3, Visa Checkout significantly increases sales conversion for online merchants. Visa Checkout customers in the United States completed 86 percent of transactions compared to 73 percent for PayPal Express Checkout and 57 percent for traditional merchant checkout options. Visa Checkout customers are also more active online shoppers in general, completing 30 percent more transactions per person than the overall population of online shoppers. Visa will demonstrate how biometrics and in-vehicle integrations are being incorporated into Visa Checkout at Mobile World Congress, February 22-25 in Barcelona, Spain (Hall 6, Exhibit Booth 6D40). For more information, please visit visacheckout.com. 1 eMarketer Worldwide Retail Ecommerce Sales, December 2015. 2 eMarketer US retail sales estimate 2014-2015. 3 comScore 2015 Visa Checkout Study, commissioned by Visa. Based on data from the comScore research panel of one million U.S. PC/laptop users, April-October 2015. Visa Inc. (NYSE:V) is a global payments technology company that connects consumers, businesses, financial institutions, and governments in more than 200 countries and territories to fast, secure and reliable electronic payments. We operate one of the world’s most advanced processing networks — VisaNet — that is capable of handling more than 65,000 transaction messages a second, with fraud protection for consumers and assured payment for merchants. Visa is not a bank and does not issue cards, extend credit or set rates and fees for consumers. Visa’s innovations, however, enable its financial institution customers to offer consumers more choices: pay now with debit, ahead of time with prepaid or later with credit products. For more information, visitusa.visa.com/about-visa, visacorporate.tumblr.com and @VisaNews.